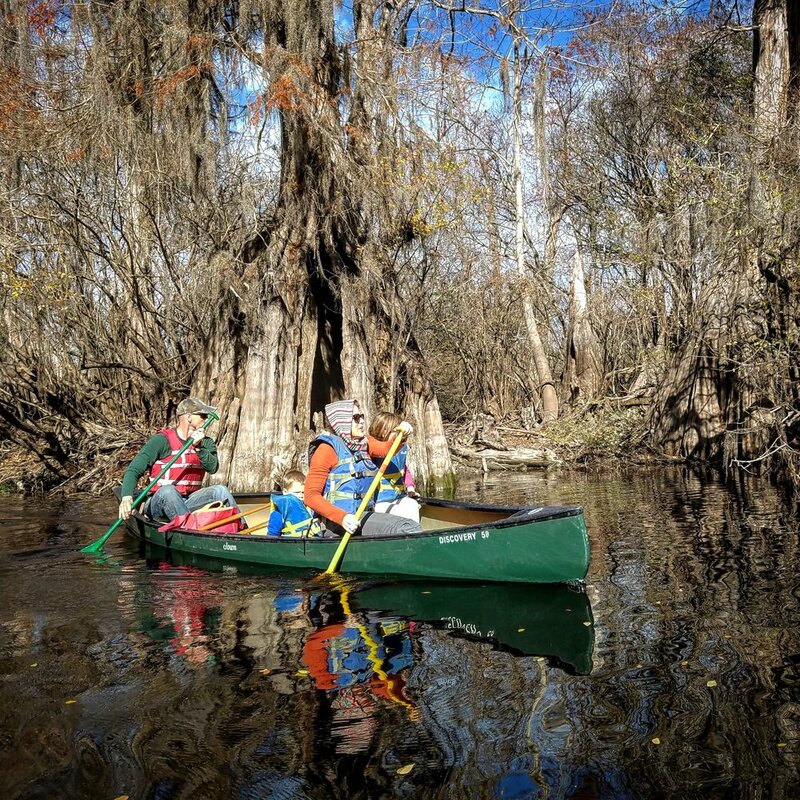 On Saturday, November 23, join the Georgia Conservancy for a day paddle on beautiful Ebenezer Creek. At 9 AM, we will meet at the New Ebenezer Retreat Center for light breakfast and a short program on the history and importance of Ebenezer Creek and the Springfield Ebenezer Creek Greenway Initiative led by The City of Springfield. At 10:30 a.m. we will head to Tommy Long Landing to begin our paddle (Click for Directions from Springfield or Savannah). A shuttle service will be provided. We will depart at 11 AM on our 3-hour paddle towards the Savannah River. Along the way, our naturalist guide Cathy Sakas will share her extensive knowledge of the flora and fauna of the cypress-tupelo swamp, as well as outline the history of the area, including the Native American eras and when the Salzburgers landed in 1734. Plus, we will visit a very meaningful and historic site along the river known as Ebenezer Crossing and learn about its significance from DNR's Coastal Resources Division. Only an hour's drive from Savannah, Ebenezer Creek provides several leisurely day trips for canoeists. Ebenezer Creek is also the only coastal stream designated as a "Wild and Scenic River" by the Georgia General Assembly and has been called "Georgia's best example of a blackwater stream ecosystem". The swamps boarding the creek contain excellent examples of water tupelo and virgin bald cypress bottomlands. Many other aquatic plants such as parrot feather, pennywort, carnivorous bladderwort, tiny duckweed, and the floating mosquito fern occur in abundance. The bald cypress and tupelo that line the creek are hosts to such epiphytic plants as Spanish moss, resurrection fern, the uncommon green fly orchid and the parasitic American mistletoe. The Georgia Conservancy, under the leadership of Bob Kerr, worked with the local community in Effingham County including the Salzburger Society to recognize the natural and historical importance of Ebenezer Creek. Georgia Conservancy trustees held a canoe trip in 1980 and saw first-hand the unique beauty of the area. In 1981, the Georgia Legislator made Ebenezer creek a Georgia Wild and Scenic River. It is one of three Georgia Rivers with that distinction and the only one on the coast. Ebenezer Creek is also designated a National Natural landmark by the National Park Service. Some of the cypress trees in the corridor are estimated to be more than 1,000 years old. Trip Price: Day Paddle - $50 per person. Cost includes light breakfast and guided paddle. Canoe rental not included, if you need a boat, please add during registration. Did you know? Georgia Conservancy members have the opportunity to register early for select Stewardship Trips, as well as receive a discount on a number of our adventures during the year. Become a Georgia Conservancy member today, or renew your membership. Already a member? Use your email provided promo code for early registration and to receive a discount (Live Oak Level and above) when registering for this trip. The Ebenezer Creek Paddle is one of our twelve Heartland Rivers of Georgia trips featuring camping, paddling and stewardship in south and central Georgia. The series brings to light conservation efforts, economic development and recreational opportunities on the Flint, Ochlockonee, Ocmulgee, Ogeechee, Chattahoochee, Altamaha, Satilla, Savannah and Yellow rivers, as well as Spring Creek near Bainbridge.